London head coach Danny Ward hopes his promoted side can build on their 42-24 victory over Wakefield on the opening weekend of the Betfred Super League season. Wakefield raced into a 12-0 lead after 10 minutes and extended that advantage to 18-6 before the Broncos overturned the deficit to lead 26-18 at half-time. 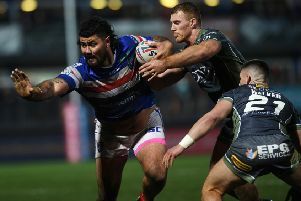 Kyle Wood scored early in the second half for Wakefield but a further three Broncos tries secured a first win in the Super League since 2014. Ward admitted that there was nervous energy within the group before the match began, but was happy with how events unfolded. “It was a worrying start, I think the boys were a little bit edgy, a little bit nervous early on and it showed we didn’t handle the pace of the game,” Ward said. “Wakefield came out fast, as a good Super League side does, and we just struggled. “We had a couple of nice sets with the ball, got into the game, got a feel for it and played some good football. “I already knew what they were capable of and I think it will give the boys real belief as well. “They probably were a little bit nervy going into it and I did get that sense in warm-up that it might have just dawned on them that they were in the Super League now and coming up against some quality players. “It finally sunk in and you could feel the nervous tension there from a few of them. Wakefield head coach Chris Chester confessed the performance was potentially the worst he’s seen since his arrival in 2016. Chester said: “Without taking too much credit away from London, we killed ourselves today with a lack of respect for the ball. “I’m extremely disappointed. It’s probably the worst performance since I’ve been involved here. “We hurt ourselves today. Defensively we were all over the shop, we have never been so nervous. The first five tries came from some really poor defensive reads. “I’m disappointed for the fans that turned up today. I take responsibility. We just looked lost today but we have got to find a way back. “It’s just frustrating because I got a sense during the week there was a bit of a relaxed attitude, there were a couple of sessions that didn’t go entirely to plan but, as the week went on, we got better. “It just seemed to be one of those games, that first 15-20 minutes I thought we were really good and scored some nice tries but without looking at the video I have no idea what happened for that last 60 minutes. London Broncos: Walker, Williams, Kear, Dixon, Abdull, Cunningham, Pitts, Fozard, Richards, Gee, Fleming, Mason, Yates. Subs: Battye, Pelissier, Ioane, Lovell. Wakefield Trinity: Hampshire, Johnstone, Tupou, Lyne, Jones-Bishop, Miller, Brough, Ashurst, Randell, Kopczak, Arona, Batchelor, King. Subs: Fifita, Wood, England, Crowther.